In your search for the perfect home, you may find yourself considering several different options or styles of living along the way. This includes single family homes, apartment units, townhomes, etc. Another concept is one that is utilized here at Moore Station Village, known as a Planned Unit Development or PUD. A PUD, is a type of residential development where the homes are usually grouped together on lots that may be slightly smaller than typical and where there are large and open park like areas and other amenities within the development. Ownership is in fee simple, which is similar to most other residential homes that people are familiar with. The common areas that are within the development are owned jointly by all the residents, so if there were 50 homes then each owner would have 1/50th ownership. Another feature is that the land beneath the home is also included in the ownership of the property. PUD’s have become popular over the years because they can add specific requirements that normal zoning ordinances may not address. Many believe that these more stringent guidelines can help preserve property values in a neighborhood. Advantages of a PUD development include the ability to incorporate protected natural areas that cannot be developed, such as a park or other green area. Some communities may include nature trails, bicycle paths and other amenities. Moore Station Village’s amenities include a pool, playground equipment for the little ones, a spacious village center used to accommodate large gatherings for any of our residents, stocked fishing ponds, miles of well maintained walking trails, a community garden, gym with exercise equipment and free weights, and biweekly lawn maintenance throughout the development. All of these amenities and services are for the exclusive private use of homeowners within Moore Station Village. The ability to access these amenities is one of the major benefits of living in a PUD. Owners pay for their own repairs and insurance, however homeowner dues, which are managed by the home owners association (HOA), pay for maintenance of the common areas such as grass mowing or pool maintenance. The sharing of expenses among all homeowners in the development through an HOA is much more affordable than having to pay for each amenity individually. Currently, the HOA dues for residents of Moore Station Village are set at $2500 per year billed semi-annually. In 2016, the average cost of installing an in-ground pool in Georgia was $21,919. Pool maintenance and utility expense averages $244 per month alone. Add in a gym membership at $40 per month, yard maintenance expense of roughly $2000 per year, pond maintenance costs of $500 per year, and free clubhouse use for gatherings can save you as much as $400 per use. If all these amenities are taken into account, it’s easy to see why PUDs have become so popular. And $200 per month is a small price to pay for what would be tremendously expensive for an individual homeowner. Moore Station Village….come home to good living! In Dublin, Georgia the air is a little fresher and the handshakes a little firmer. Here Southern hospitality is more than a habit – it’s a way of life. There’s a deep appreciation for life’s simplest pleasures. Dublin is the perfect setting for Moore Station Village. Moore Station Village is an appealing blend of yesterday’s values and today’s innovations. 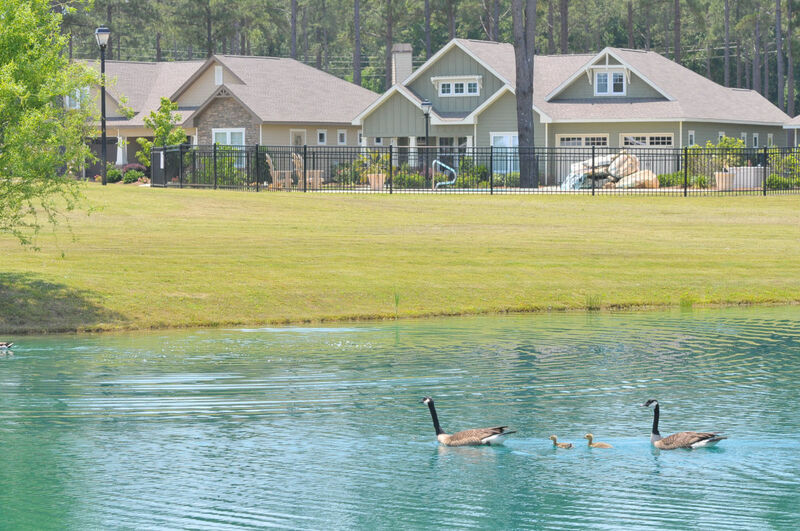 People of all ages live in a residential community enhanced not only by its architecture but by some of the most gorgeous scenery Georgia has to offer. Feeling at home is easy at Moore Station Village. Welcome to a unique place – and a unique opportunity.